The ACLS Provider Course is designed to teach providers the knowledge and skills needed to evaluate and manage the first 10 minutes of an adult VF/VT arrest. 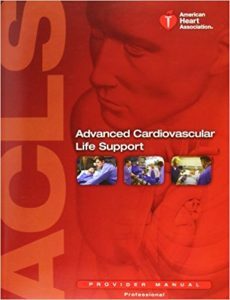 Students are expected to learn to manage 10 core ACLS cases: respiratory emergency, 4 types of cardiac arrest (simple VF/VT, complex VF/VT, PEA, and asystole), 4 types of prearrest emergencies (bradycardia, stable tachycardia, unstable tachycardia, and acute coronary syndromes), and stroke. *Current BLS card is required to take this course. We understand that your ACLS class sometimes gets put on the back burner. We are more than happy to try to fit you in today! © 2018 Michiana Healthcare Inc. All Rights Reserved.